To be eligible for the Honeycomb’s Bee the Boss Contest, an individual must be a legal resident of Canada (excluding the province of Quebec) and be of the age of majority in his/her province or territory of residence or older. 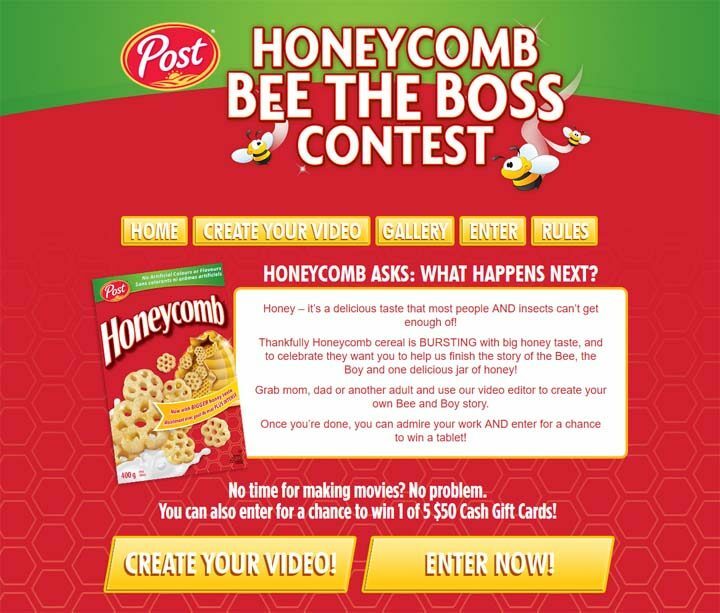 The Honeycomb’s Bee the Boss Contest ends at 11:59 p.m. ET on June 25. There is no purchase necessary to enter the Contest. To enter for a chance to win a Secondary Prize, complete and submit the entry form located at ytv.com/honeycomb. To enter for a chance to win the Grand Prize, entrants must complete and submit the entry form on the Contest Website and click on the link to create a video to submit a video in which they provide their interpretation of the end of the story of the Bee, the Boy and one delicious jar of honey. The Work must be created using the video tool on the Contest Website and will incorporate video and audio clips provided through the video tool. Entrants will not be submitting their own content in the creation of the Work. Limit of one (1) entry per person per 24-hour period. (a) Secondary Prizes. There are five (5) secondary prizes available to be won by the Secondary Prize winners consisting of a Visa gift card in the amount of fifty Canadian dollars (CDN $50.00). (b) Grand Prize. There is one (1) grand prize available to be won by the Grand Prize winner consisting of a tablet in silver, 32GB with Wi-Fi and Cellular Connectivity. The Grand Prize has an approximate value of seven hundred and fifty Canadian dollars (CDN $750.00).